According to the Direct Marketing Association, nearly two-thirds of marketers are using multichannel marketing. In addition to the brand reinforcement that comes from channel integration, these programs take advantage of the best that each channel has to offer. For example, unlike its email counterpart, direct mail does not require opt-in permission. When lists are purchased from a reliable provider, they are highly accurate and up to date. You can specify a wide variety of demographics and buyer profiles that enable you to create personalized, relevant communications right out of the gate. Rented email lists, on the other hand, are less accurate. They go out of date quickly, and in most cases, they don’t have the benefit of the same demographics and profiled behavior as mail lists. What email does have is immediacy. It can be precisely timed—down to the minute—is easily trackable and allows for immediate response. Both channels have benefits and drawbacks, but if you use them together, they pack a powerful punch. Combining them gives you access to all of the same demographics for both lists. Use what you know from your mailing database to create more personal, relevant emails. Use email activity to learn new things that you can use in your print marketing. Using direct mail and email together lets you create a one-two punch of print and electronic delivery. Now add in the ability to track direct mail through the U.S. Postal Service and know exactly when the mail hits. This gives you the ability to time email follow-ups and reminders within a very tight window to maximize response. According to the DMA, campaign response rates can increase by up to 35% when direct and email are used together in an integrated campaign. Now throw in the use of video, social media, and immediate print response mechanisms like QR Codes and you’ve got marketing jambalaya—with heat. 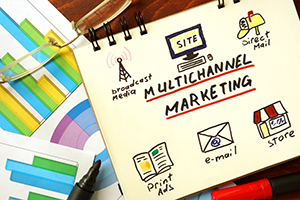 Want to spice up your multichannel marketing? Give us a call and let us help you create something outstanding!